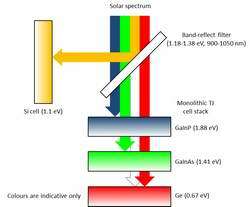 The Australian University of New South Wales (UNSW) back around 1985, invented a Super efficiency Gallium Arsenide Solar Cell, these are multiple layered PV cells that converts more rays of Sun's energy efficiency to over 40%. 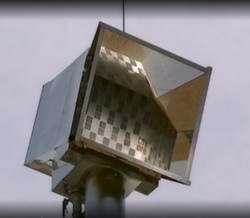 This world record was set by Dr Mark Keevers and Professor Martin Green , Senior Research Fellow and Director, respectively, of UNSW’s Australian Centre for Advanced Photovoltaic's , using a 28 square centimetre four-junction mini-module – embedded in a prism – that extracts the maximum energy from sunlight. 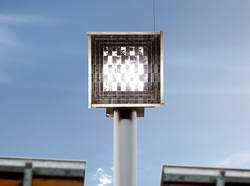 It does this by splitting the incoming rays into four bands (light spectrum’s), using a hybrid four-junction receiver to squeeze even more electricity from each beam of sunlight. There are two different types of Cells being developed using Gallium arsenide, instead of Silicon, where Two of these 10cm (4") Gallium Arsenide Solar Cell replace approx. 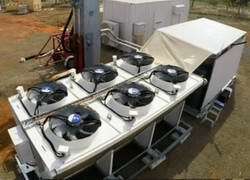 15 conventional 270W Solar Cells (4'000W÷270=14.8 panels), and 1m2 of Gallium arsenide Cells Harvests 220kWh (0.22MWh) of Energy, where a 4m2 collector cell/unit harvests 1MWh of energy. ...see this video for more information. 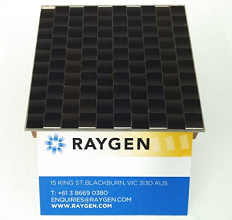 The ultra-high efficiency module RayGen uses is nearly twice as efficient when compared to traditional silicon PV panels (up to 40% compared to 20%), the light is focused over 600x by mirrors onto the PV Ultra panel in the receiver. The PV Ultra panel produces over 1200x the electrical power vs regular silicon photovoltaic panels of the same area. This means that PV Ultra is much more value intensive. 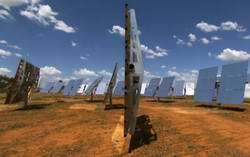 Standard photovoltaic systems require 6,000m2 of flat panels per MW. 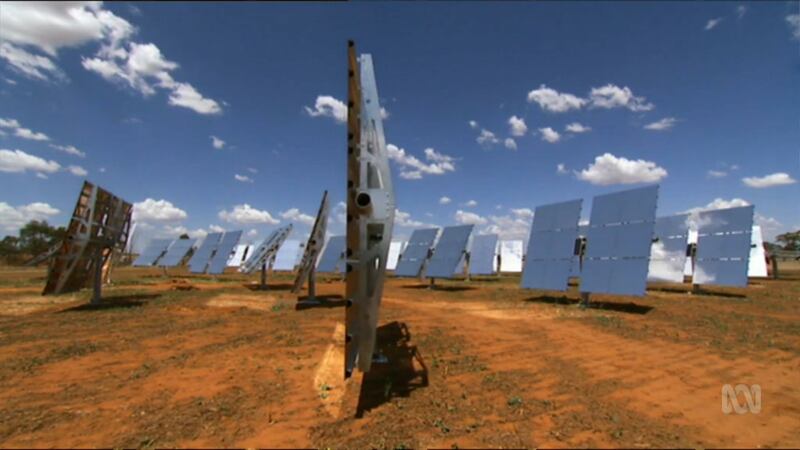 PV Ultra uses 3,600m2 of mirrors and just 4m2 of photovoltaic material per MW. That’s right – every square metre of RayGen modules can produce 250kW of electricity, and that’s before considering over 400kW of heat energy. Both Silicon PV and PV Ultra systems require the same land area – however the optimised 2-axis tracking field can increase electricity yield by 15% vs standard silicon PV. 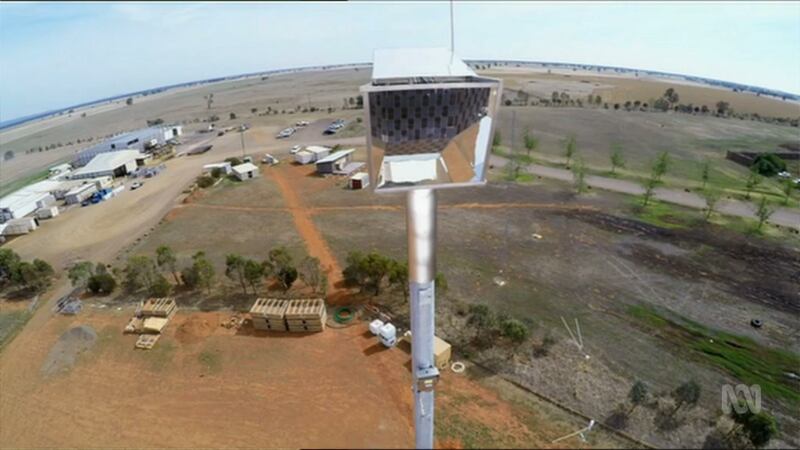 In addition, the heliostat's are wireless and raised off the ground, enabling dual land use, such as grazing. Like CSP, PV Ultra collects the sunlight using heliostat's focuses light onto a tower, but that is where the similarities end. 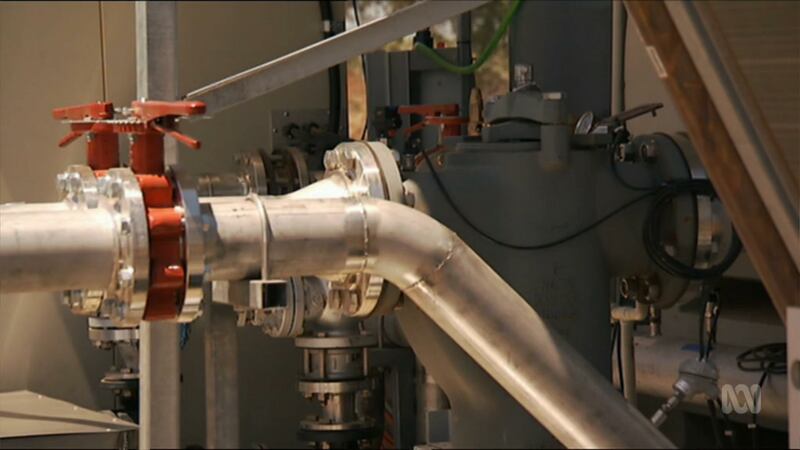 Where CSP uses a thermal receiver and complex, expensive heat turbines that require a lot of maintenance, PV Ultra uses a photovoltaic cell that requires little maintenance and upkeep. To be efficient, CSP requires tall, massive towers over 150m high (similar to a sky-scraper over 50 stories high). By contrast, PV Ultra’s tower is thin and less 45m high (similar to a standard light tower). 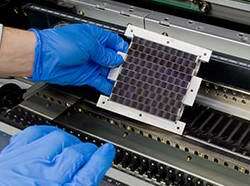 RayGen has already demonstrated its commercial efficiency at 1/4MW. 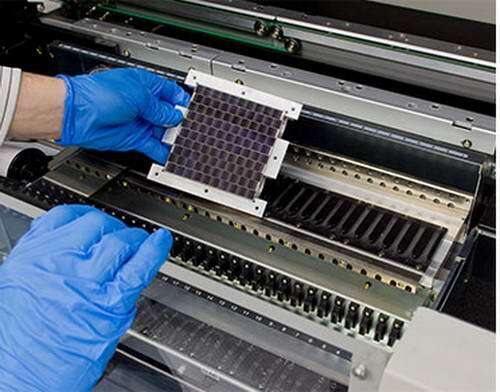 The manufacturing processes for the cell modules and heliostat's use existing automation technologies currently used in industry – automotive manufacturing techniques and facilities for the heliostat, and standard electronics manufacturing for the cell modules. This means that PV Ultra delivers reduced cost to scale, equipment is pre-fabricated and installation is rapid, labour costs are lower, and leveraging existing automotive and electronics manufacturing makes it easy to meet local content requirements. The R3-1.0MWe, is for customers who have power needs of over 1MW electricity. 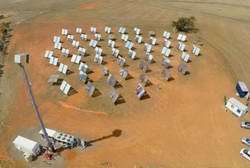 The system requires six acres of land (24281m2 =156mt x 156mt) for its 273 Heliostat mirrors and its 40m tall tower containing a 4m2 ultra-high efficiency receiver onto which the light is focused. It has a rated power of 1.1MW DC, and 1MW AC. Thanks to the sun-tracking duel-axis (2-axis) mirrors, PV Ultra will operate at peak power for considerably longer each day than fixed flat panel displays. 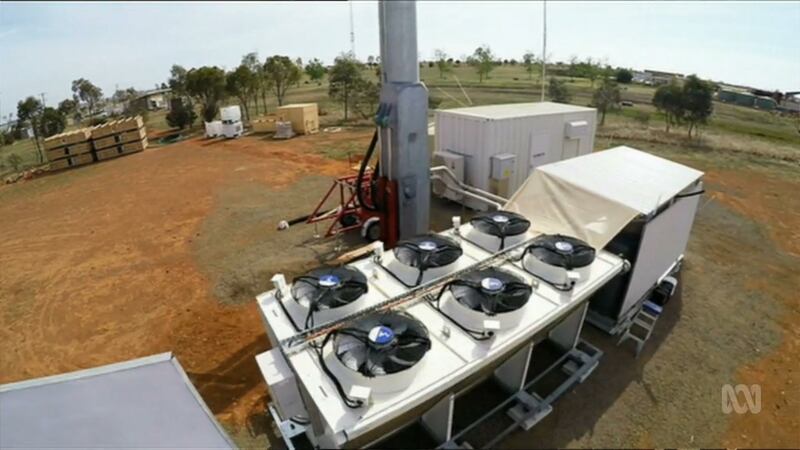 While generating electrical power, the system will also capture over 2MW of heat, which can be pumped up to 7 kilometres and used for a variety of purposes and lower the environmental impact of a site by reducing or even eliminating the need for gas, diesel or electric power to generate heat. With RayGen’s PV Ultra R3-1.0MWe your investment is guaranteed, with long-term investment protection and options for future software and module upgrades. The Raygen R1-0.2MWe, is for customers who have power needs of up to 0.2 MW electricity. 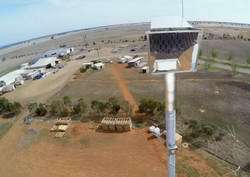 The system is compact, requiring just 1.5 acres of land for its 68 2-axis mirrors and single 25m tall tower containing an ultra-high efficiency module onto which the light is focused. It has a rated power of 240kW DC, and 215kW AC. This array also uses duel-axis mirrors, PV Ultra will deliver power for longer than fixed flat panel displays. 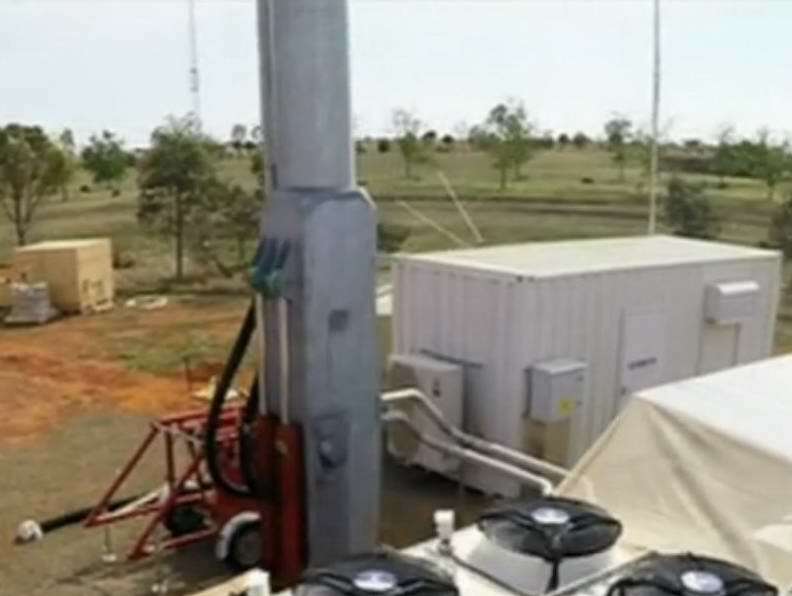 While generating electrical power, this size system will capture over 400kW of heat, which can also be pumped up to 7 kilometres and be used for a variety of purposes and lower the environmental impact of a site by reducing or even eliminating the need for gas, diesel or electric power to generate heat. With RayGen’s PV Ultra R1-0.2MWe your investment is guaranteed, with long-term investment protection and options for future software and module upgrades. 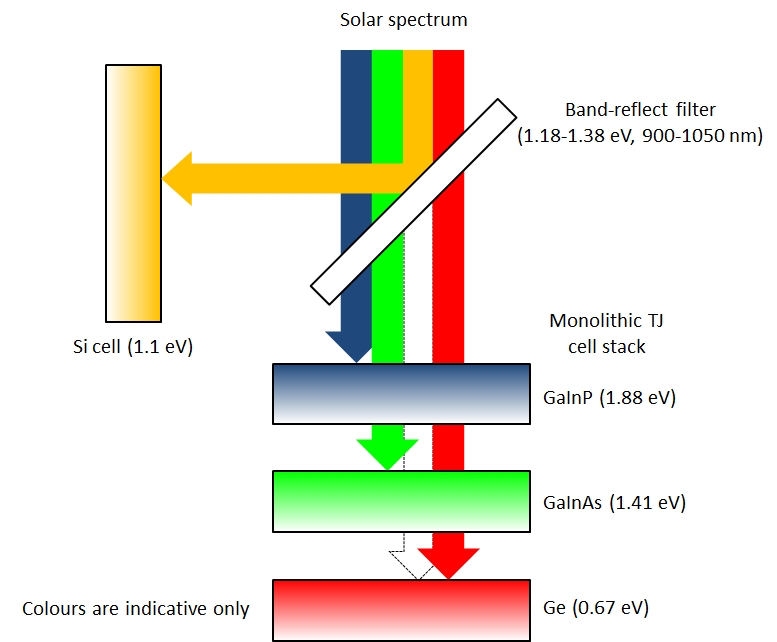 Remember: Gallium arsenide Solar Cells are up to 45% efficient at harvesting energy from the sun, where quality solar cells are currently around 17~20% efficient. Actual size of a 2kW Gallium Arsenide Super Cell is (approx. 10cm x 15cm) shown above next to a business card. Each layer of a four-junction cell extracts energy at its most efficient wavelength, while unused light passes through to the next layer. 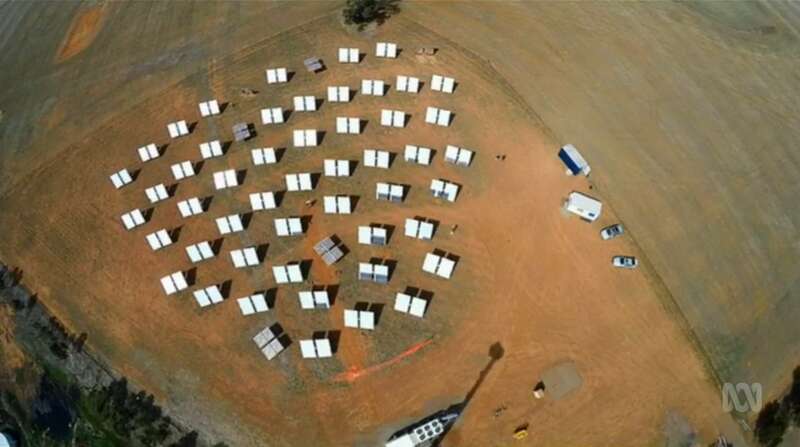 Model of a 5MW Gallium Arsenide Solar Farm using 23x 220kWh RayGen Arrays, with Wireless DAT Heliostat Arrays. 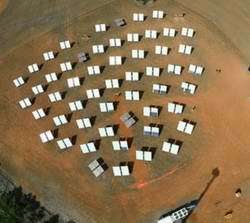 Model of a single 1MW Gallium Arsenide Solar Farm, 5MW requires 5x 1MW RayGen Arrays, each requiring 273 Wireless DAT Heliostat Arrays. 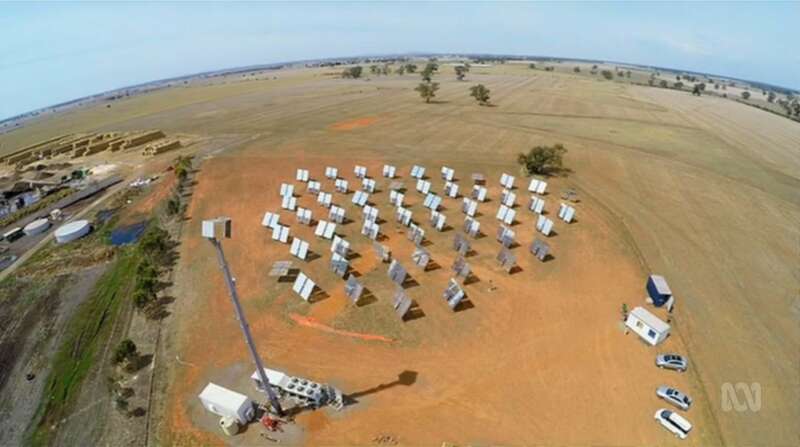 First 220kWh Gallium Arsenide solar farm, built in Victoria, Australia. 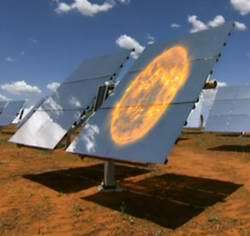 220kW with 68 Heliostat mirrors array. 200kW Array Tower is 20mt high. 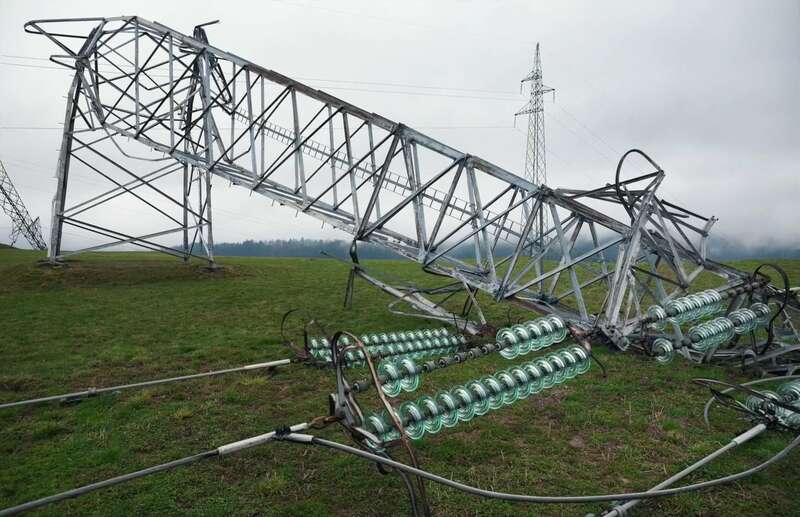 1MW Array will require 45mt Tower. 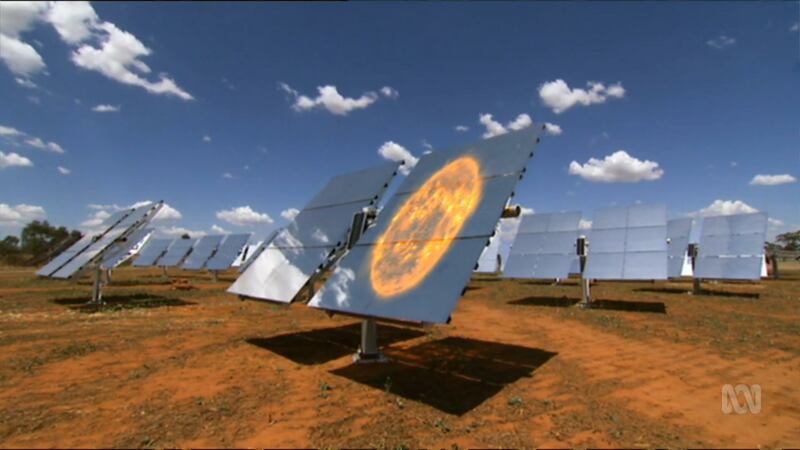 Heliostat mirrors focus the suns rays onto the Tower Concentrator Head. 100 Super Cell Head (200kW farm) is only 1m2. 400 Super Cell Head (1MW farm) is only 4m2. Heliostat mirror focus the suns rays 365 times there strength onto the Tower. 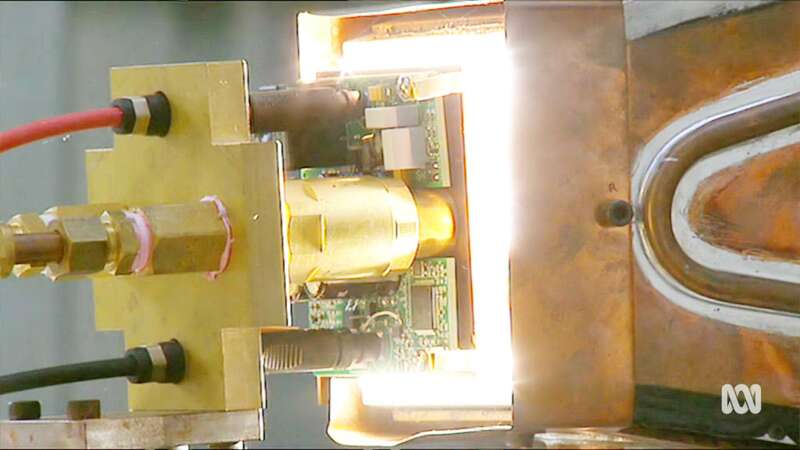 Self powered mirrors create a wireless field, creating a cheaper and simpler install. a 2kW Cell size is amazingly small. 2kW Cell R&D Heat sink. 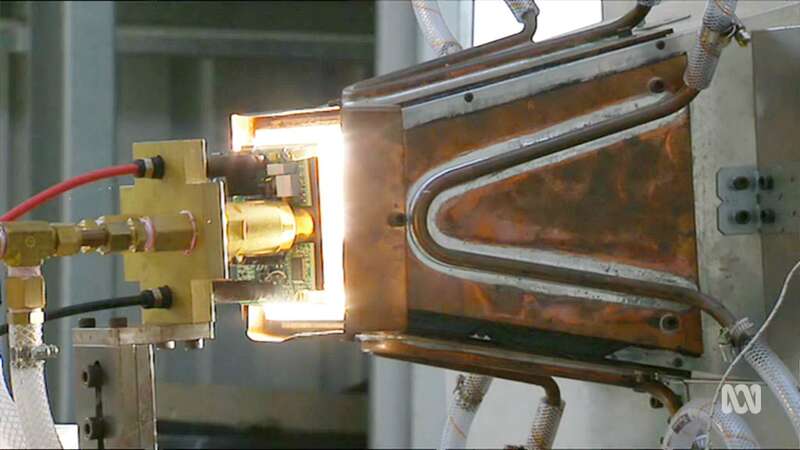 2kW Cell & Copper R&D Heat sink. 2kW R&D Cell Testing Temperature. 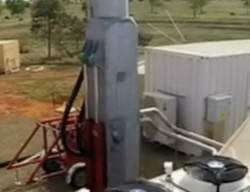 Hydraulic unit for raising & lowering of the Tower for maintenance. 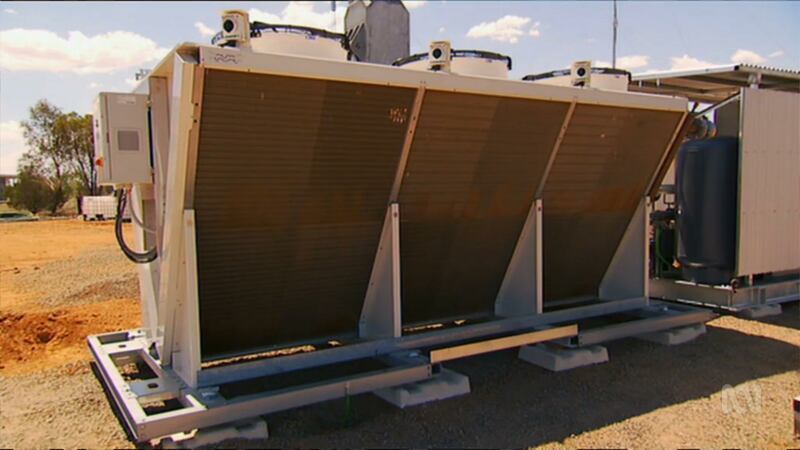 Cooling Fans & field Sub-station skids. 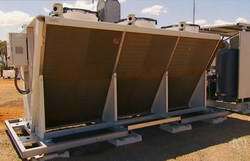 Cooling Radiators & condenser units. 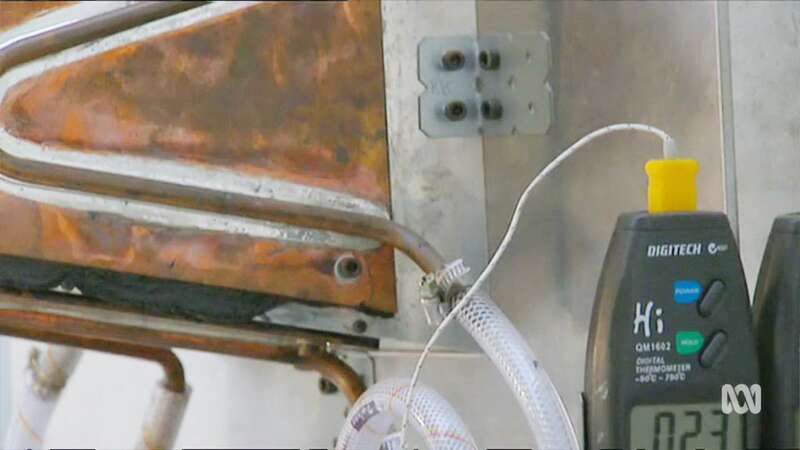 Thermal Heat Plump & plumbing for the system.